These days being able to purify your water is more important than it has ever been before. Especially when you look at the situation that has been going on in Flint Michigan for the last two years. People in the city have been forced to use bottled water as the water from the city is too dangerous to use. The problem however is most purifying systems are overpriced and ineffective. And this is exactly why reasonably priced reverse osmosis systems have become very popular in recent years. Not only are they affordable, but they can also help improve the quality of your health. 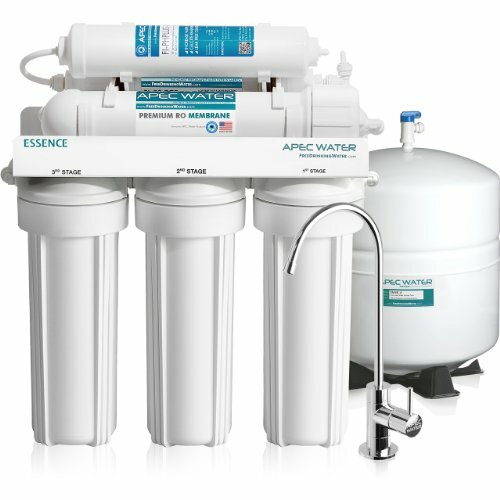 The Global Water 5-Stage Reverse Osmosis System is a high performance filtration system that provides users with great tasting water. Thanks to premium NSF filters this system is able to reduce the quantity of dissolved solids and remove up to 99% of contaminants. Some of the contaminants it can remove includes lead, fluoride, chlorine, arsenic and bacteria just to name a few. With high quality quick connect fittings you can have this system up and running in a matter of minutes. The filters are colored coded with clear instructions on the front of each one. The parts of this system are 100% lead free and includes an NSF faucet and NSF steel tank. All replacement parts for this system are universal and they pass all standards for safety and security. Check PriceThe system has been tested and is guaranteed to last a very long time. It is also guaranteed it will provide high quality drinking water without any problems or difficulties. Stage 1 – During the first stage the water will go through a NSF Polypropylene 5 micron Sediment filter. This is where large and fine particles, dust, mud and sand get removed. Stage 2 – During the second stage the water will be sent through a GAC coconut shell activated carbon 10 inch filter. 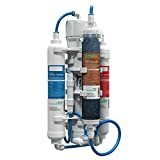 This filter will remove colors, odors, turbidity, organics, chlorine and a host of other chemicals. Stage 3 – During this stage the CTO 5 micron coconut shell block carbon filter will remove cloudiness and taste from the water. It will also remove any chlorine or odors that were left behind from the second stage. Stage 4 – Stage 4 is where the NSF RO (reverse osmosis) membrane, which is a high quality TFC RO membrane, starts to remove up to 99% of the contaminants found in the water. This includes heavy metals, arsenic, salt and a host of other dissolved chemicals. Stage 5 – The fifth and final stage is when the inline cartridge filter will remove the bad taste and smelly odors. After all 5 stages have been complete you will have fresh, clean, great tasting water to drink whenever you want. How Does The Global Water 5-Stage Reverse Osmosis System Compare To Other Systems? The best way to answer this question is to review some of the other top reserve osmosis systems currently on the market. And while there are literally hundreds of brands on the market, we will focus on top ranking systems based on reviews from users. This American made system removes 99% of contaminants and is noise free. Some of the contaminants it removes include copper, chromium, radium (226/228), barium and a host of others that can be found in both tap water and well water. The one con has to do with quality control. Some have complained the product is made very poorly. This reverse osmosis system is capable of removing up to 98% from the water. It is especially good at removing chlorine. It can also eliminate dissolved salts and filter out a host of other contaminants. When compared to a more traditional filter you will find the Home Master has a better flow rate of water due to its larger tubes and fittings. The interesting thing about this system is that it mineralizes the water two separate times. It also adds calcium and magnesium while mineralizing the water. In order for the system to work it needs standard valves. And while the manufacturer uses valves that are exclusive to the system, they can easily be replaced with standard ones. If the tube isn’t in just the right angle it will start to leak at the connection points. To avoid this make sure the tube isn’t excessively bent. 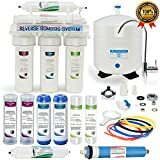 While there are many reverse osmosis system on the market to choose from, the Global Water 5-Stage Reverse Osmosis System is affordable and has proven to be effective. It was made using expert standards and produces top quality drinking water that’s clean, refreshing and natural tasting. You can be sure this system will provide you with clean water in a quiet and very efficient manner. It also comes with 4 extra filters at no additional charge. And with a price tag of under $150 it is by far one of the most affordable on the market. My name is Mr. Russell Taylor. 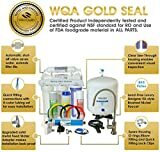 I am interested in ordering some RO System from your company but since this is the first time am ordering these kind of products then I would be very glad if you can provide me with a list of sizes and pricing of the RO System you carry in stock for sale. Also let me know if you do take a surcharge when accepting either a Visa or Master Credit Cards payment. I’m actually not a manufacturer, just a water enthusiast, who had to deal with a horrible water contamination situation in the past, as a result I’m pretty wary of tap water, and don’t want the same situation to happen to other folks. But if you click on the links above this article, it will take you to amazon, and I’m sure you can contact the manufacturer directly from there. 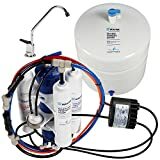 -I understand reverse osmosis can make water drinkable but can a reverse osmosis device also be used to filter water from let’s say the washing machine and shower and supply that filtered water to use for irrigation(water hose), toilets, and washing machine again? Sure, Reverse Osmosis can filter the water from washing machine and shower for recycling it and then use it for irrigation, toilets and washing machine again.